Conference Fee- Early bird registration end on 20th April. Deadline for registration and payment: 31th May 2013! 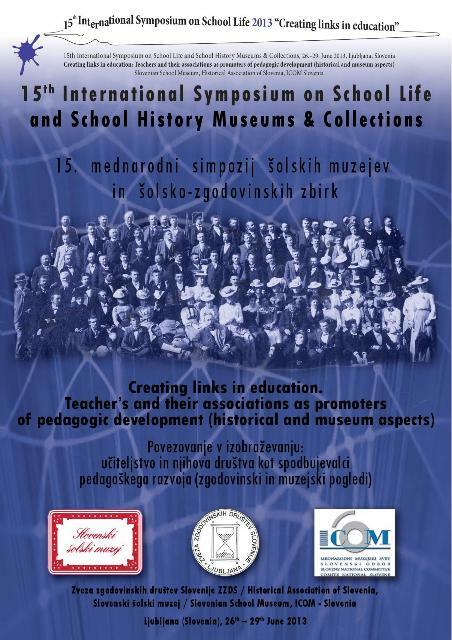 - The aim of the symposium, which connects school museums and researchers into the history of education, is to present and explore the professional historical contribution of male and women teachers and particularly their associations to the development of schools and pedagogy, as well as to cultural and general development. Teacher associations united the teaching profession in the establishment of their (trade union) interests, had a significant influence on the development of teacher education (including their adult and continuing education) and, through teaching and educational publications of different ideological orientations, helped to shape the development of education. Teachers’ gatherings, publishing activities and the appearance of school museums were among the most important forms of activity. - Teacher associations and their regional, national (ethnic), state and international connections went beyond the local importance of frequently very diverse activities. They were marked in particular by individual teachers who were important for a particular village, town or wider region. Through changes that took place over time, we can also discern the differing importance attributed to the teaching profession, which is why we also encourage comparative analyses of the role of teachers and their associations. Contributions offering an overview of a wider region or even a whole country are particularly welcome, as are presentations and analyses of archive and museum material and, above all, insights into our museums through an analysis of exhibitions on this subject. - The theme of teachers, teacher associations and their work and other connections in education is directed at specialists working in museums both large and small and in other collections related to school and education, as well as at researchers and lecturers who are involved in the history of education at universities, institutes and in archives. -The presentation of museological news of the family of education / school museums and successful museum projects regards to the history of education are welcome. - The working language of the conference is English. Paper presentations should last between 15-20 minutes, including 3-5 minutes discussions after presentation at plenary sessions and 90-minute parallel sections. - The “Babel Section”: Only one 90-minute session of the parallel sections (each with a maximum of 4 to 5 presentations) will take place in three groups for participants from the Germanic, Romance and Slavic language areas in one of these languages. Please note that the 'Babel Section' is designed first of all for the colleagues who work at small school museums without earlier experiences with English, the lingua franca of the modern era. All participants, including paper presenters, are expected to cover travel and accommodation costs as well as the conference fee with their own resources. Conference fee cover all symposium sessions, program materials, coffee breaks, two lunches and receptions. Conference registration will open 20th February 2013. Early bird registration will start on 20th February and end on 20th April. On 21th April, the standard registration starts. Deadline for registration and payment: 31th May 2013. Please note that accompanying person means only one member of presenter or participant familly (spouse - husband/wife, friend or partner) – and not museum or institute staff. Accompanying person fee includes: attendance to the Symposium sessions, coffee breaks, two lunches and receptions. ALL THE BANK CHARGES ARE CARRIED BY THE PARTICIPANTS! CLEARLY INDICATE THE FULL NAME OF THE PARTICIPANT ON THE PAYMENT! Please write the participant's name in the subject of the bank form. A receipt for payments will be given at the registration desk during the conference. Refund policy for symposium fee. Any cancellation must be requested in writing by e-mail to the Organising Committee (2013symposium15@gmail.com) no later than 1 June 2013 to be eligible for a refund of the total payment minus a 40 EUR processing fee. For cancellations after 1 June 2013 there will be no refund. In case of no show refund is not available. Programme: Wednesday, 26th June 2013 Opening at 16:00 hrs. Thursday, 27th June and Friday, 28th June 2013 full day programme with lectures and workshops. Saturday, 29th June lectures and workshops, in the early afternoon official conclusion of the symposium, optional excursion. The proposals of abstracts (use THIS FORM). They will have to be a Word document of no more than one page (Times New Roman 12, single spaced), including the following: Title of the paper, Author, Institutional belonging, Personal details: address, country of residence, phone number, e-mail address; A summary of approximately 250 to 300 words, which shall contain the object of the paper, the methodology which was used, the corpus or the data which were analysed and the results. Post-symposium publication: Authors will have to send their written papers (in English) by 20th September 2013, for publication of the proceedings. This special issue of the Museum's journal Šolska kronika / School Chronicle ( http://www.ssolski-muzej.si/slo/schoolchronicles.php ) will be later published containing peer-reviewed extended versions of some of the papers contributed to the conference. We ask the participants to make their own accomodation arrangements. The list below contains contact information for the recommended conference hotels (please check the prices directly!). You may now contact your hotel directly, using these details, to make your own reservation. Please indicate that reservations are for 2013 Symposium. Kindly note that all participants should pay their accommodation costs directly to the hotel. single room from 65 EUR (basic) to 92 EUR (superior) – reservation before 15 May (symposium 2013); 2-bed room from 87 EUR; 3-bed room from 97EUR (price per room, with breakfast, tourist tax and VAT). from 17-25 € (single to 2-3 bed room); shared bathroom. Payment only in cash. Early reservation with discount. Organising Committee of 15th Symposium 2013.